Spring is here and Center Stage is ready to bring the community the best of all the arts have to offer. 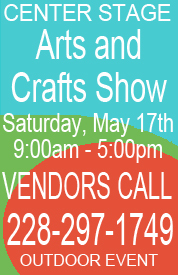 To kick off the fundraising season, Center Stage is presenting their Arts and Crafts Show on Saturday, May 17th from 9am to 5 pm, with tons of vendors showcasing the talents of local potters, painters, jewelry makers and many others that create unique items. New this year at CS is the Theater for Students for elementary thru high school. This special time for the students includes after school classes, Saturday classes and classes for home schooled children. The Center Stage Arts and Crafts Show, an outdoor event, will use the proceeds to benefit their mission to bring the best to the community. With 47 food and arts and craft vendors on site, the free event will offer something for everyone! A variety of local food vendors will serve up some of the best dishes that the Coast has to offer. Those wishing to become a vendor for the fundraiser on May 17th may call 228-297-1749. Center Stage brings a different fundraising event with each season. CS offers 4 regular season shows, 1 summer fundraiser, 1 spring fundraiser, 2 children’s theater productions annually and 1 summer children’s workshop. Stop by the CS booth at the Arts and Crafts Show to connect with the fine folks that bring so much great entertainment to the Coast. You can also find out more about upcoming plays including dramas, musicals and fundraisers. They will also be raffling off a 2014-2015 Seasonal Membership! The theater also features one night fundraisers throughout the year known as S.N.A.C.S. (Saturday Nights at Center Stage). With its fun “coffee house” style atmosphere, SNACS features well known local entertainers including David Delk, Karen Abernathy, Mike Lacey, Cliff Thompson, the Long shot Improv and more. SNACS showcases local talent through improvisational skits, wonderful music, fantastic bands and other great entertainment. The 2014 children’s workshop “Stage Stars” will be for ages 6 to 18 and is May 26th to 30th. You may call the theater to register and inquire about the cost and the daily schedule. Posted in Attractions, Making a Difference on May 1, 2014 by Admin.